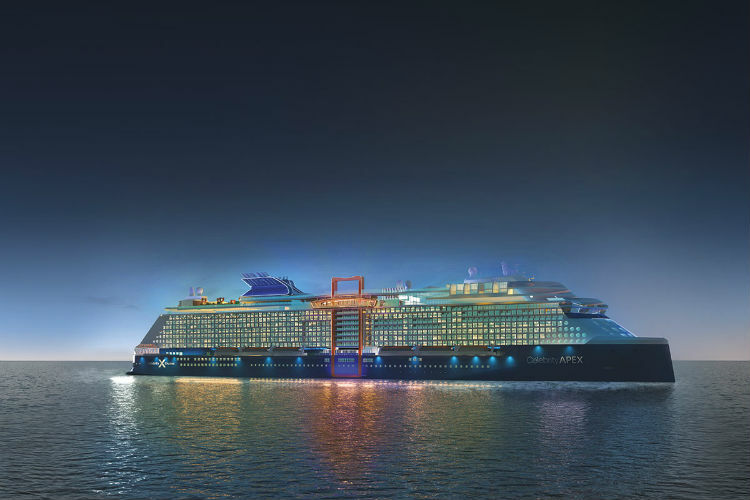 The second Edge-Class ship to arise from Celebrity Cruises, Celebrity Apex will be prepared to set sail from Southampton in April 2020. Promising luxury accommodation, world-class culinary venues and unforgettable entertainment, she will continue the revolutionary trend for Celebrity Cruises. Construction began on the ship in July, when the steel cutting ceremony took place in the Chantiers de l’Atlantique shipyard, St. Nazaire. With her being the second Edge-Class ship, many features will mirror that of the much-awaited Celebrity Edge due to launch later this year. One of the more prominent features is the Magic Carpet – a movable platform and the first of its kind to be offered at sea. Other additions include two-deck jogging tracks and martini-glass hot tubs. New accommodations will also arrive with the Edge Class, with the Infinite Veranda cabins boasting bi-fold doors to blend the outside with the inside and offer 23% more space when compared with traditional balcony cabins. The Edge Class will also be the first for Celebrity to offer solo cabins for travellers cruising alone. Celebrity Apex is now on sale – ready for you to book a place on-board for 2020! Find our latest sailings on Celebrity Apex by clicking the link below. Call our Cruise Concierge team on 0808 1234 118 for expert advice and award-winning customer service on Celebrity Cruises. When taking your family along with you on a 14 Night cruise it adds a lot of money to you cruise it's better to tip what you want to .